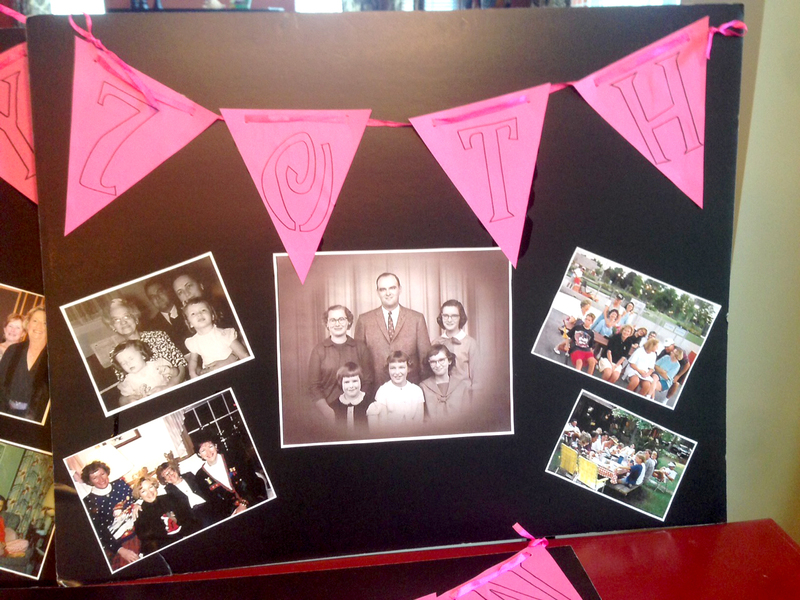 My Mom just celebrated her 70th birthday with her family and closest friends. 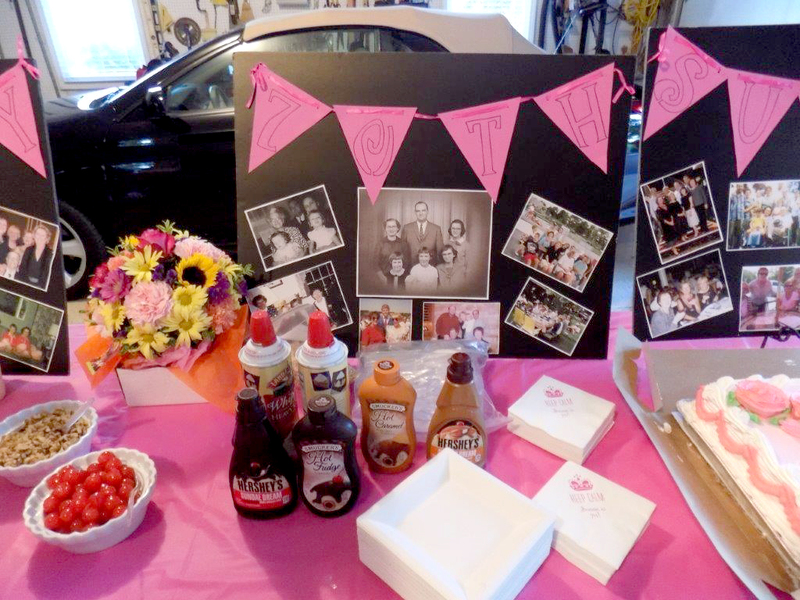 She loves sweets and we decided to do a huge table full of her favorites to celebrate her milestone birthday (Since it was an outdoor party and the weather wasn’t cooperating, we quickly had to transfer everything to the garage). To make it even more fun, we added personalized touches to the table. I put together photo collages as a backdrop for the table. I used black foamboard and had pictures printed on cardstock so I didn’t damage the originals. I attached them with clear glue. I used a pink banner kit to add some fun to the boards. Her friends and family could make their own ice cream sundaes with different syrups, whipped cream and of course nuts and cherries. 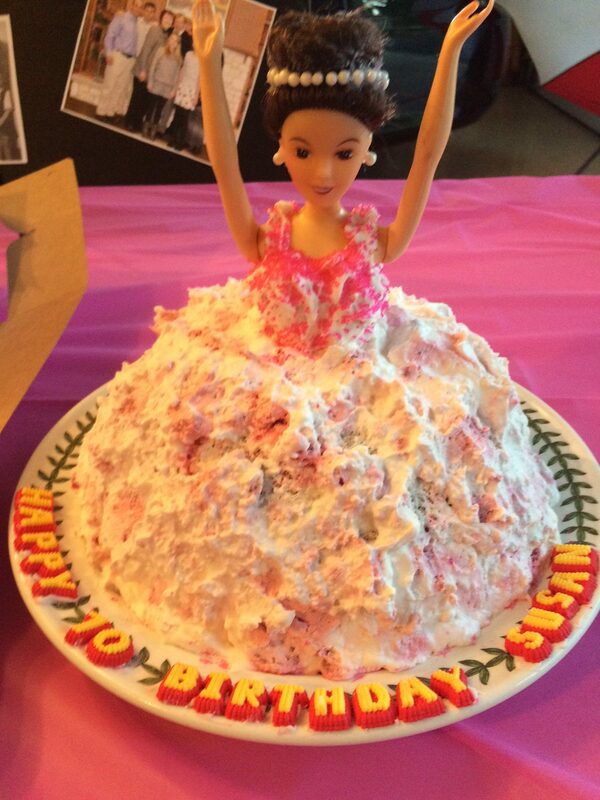 My aunt made an old fashioned doll cake to remind her of her childhood which was a big hit with her friends! My brother brought one of her favorites, a tres leche cake with fresh mango and peaches. So many choices for dessert! We also had personalized napkins for the sweet table to add another personal touch and they complimented the personalized stadium cups. The family wedding I attended recently, in honor of Carly and Jason Bradford, was one of the outstanding weddings you can imagine. 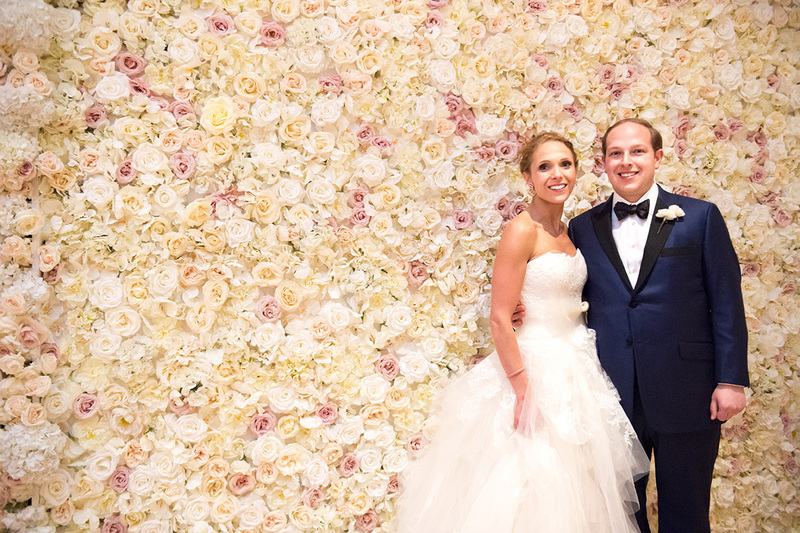 From the flowers to the table settings to the absolutely gorgeous bride and groom, the entire night was magical. And I had the pleasure and privilege of helping with the printed napkins for the rehearsal dinner and the reception. 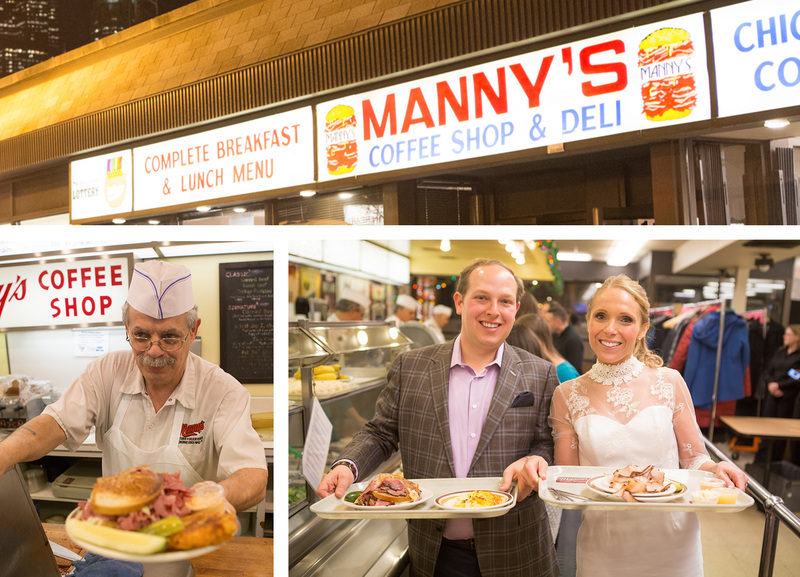 The rehearsal dinner was at Manny’s Deli in Chicago, a family tradition for over 70 years. It’s not unexpected to run into Chicago politicians, mayors, visiting presidents and celebrities there, plus the who’s who in the city. A true highlight for visitors to Chicago, it’s located in the south loop and is a “must see”. The rich history surrounding Manny’s is shown in their dining room with walls decorated with news clippings, reviews, snapshots, and memorabilia demonstrates how deeply Chicagoans treasure this historic restaurant. This is an institution in Chicago serving up daily doses of stacked corned beef, potato pancakes, brisket, soups and all the traditional deli extras that you would expect. As a selection for a wedding rehearsal dinner, there were napkins featuring fun phrases that were a bit unexpected but uniquely fun and indeed perfect for this union. 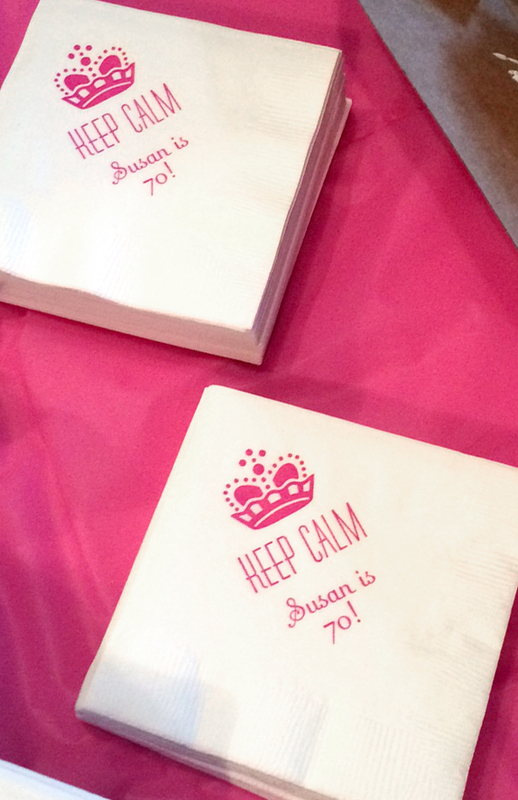 The fun napkins were used for the appetizers, drinks and desserts. 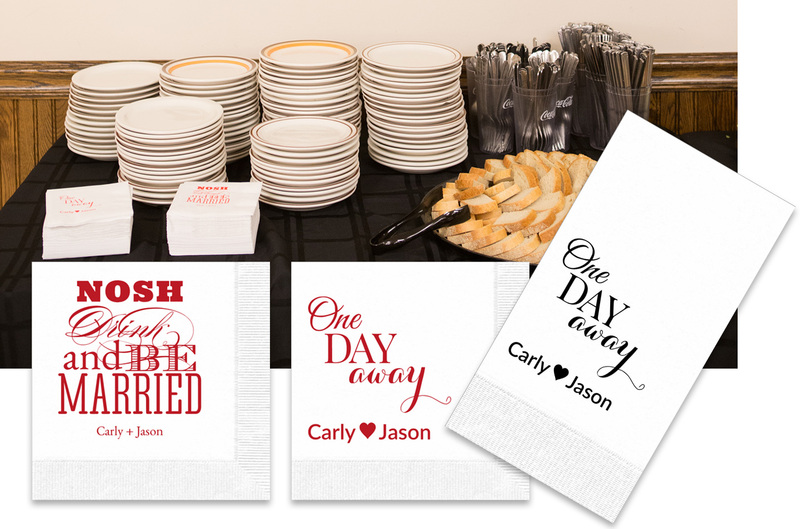 Napkins featuring expressions like “Nosh Drink and Be Married” and “One Day Away” make a fun accent to a wedding celebration! 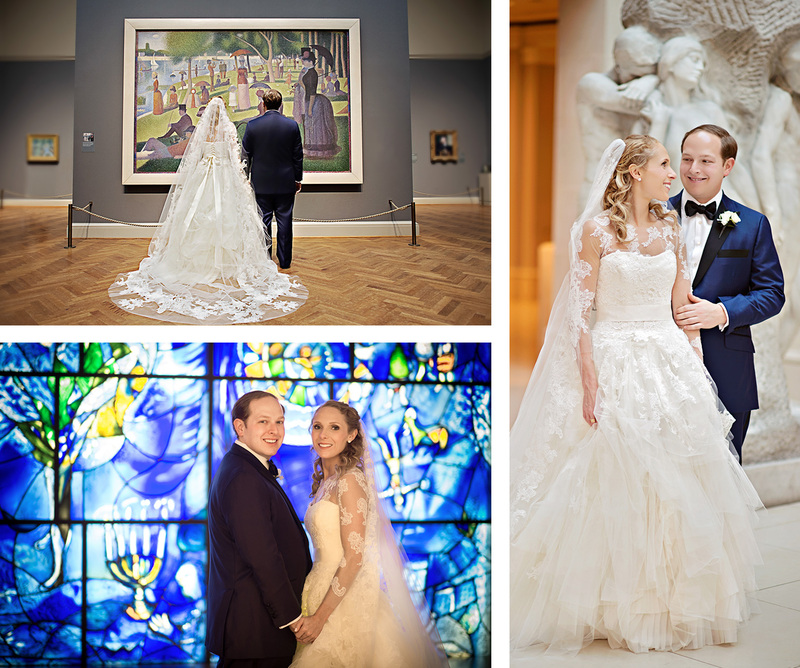 The next night, The Art Institute of Chicago’s Modern Wing was the setting for the wedding and unlimited doses of romance. The famous and gorgeous works of art provided backgrounds for photographs that will be cherished for years. Some of the memorable photographs include the stained glass windows by Marc Chagall, who infused his landscape of familiar American icons, references to Chicago, and symbols of the fine arts with an ethereal approach. And there is the famous painting A Sunday Afternoon on the Island of La Grande Jatte painted in 1884 by Georges Seurat, not to mention the many sculptures ideal as artistic backdrops. 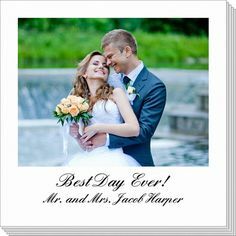 The truly romantic evening featured absolutely gorgeous flowers and candles which enhanced the beautiful ceremony, not to mention the exceptional wedding gown and grooms tux, wonderful music, plus a ceremony intertwined with a story of love, romance, and family history. 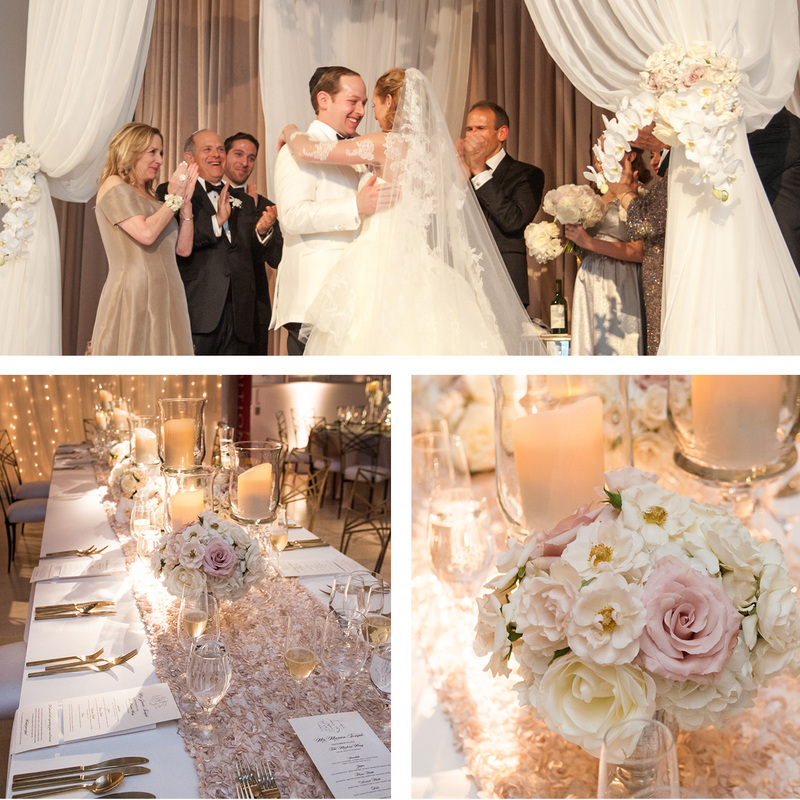 The table settings enhanced the wedding reception and was a masterpiece of style and sophistication. 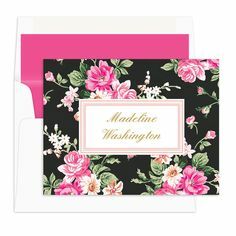 Both the monogram and duogram with wedding date were selected to be used on many of the printed wedding essentials featuring the artwork used on the wedding invitation, itinerary, wedding program, place cards and more. 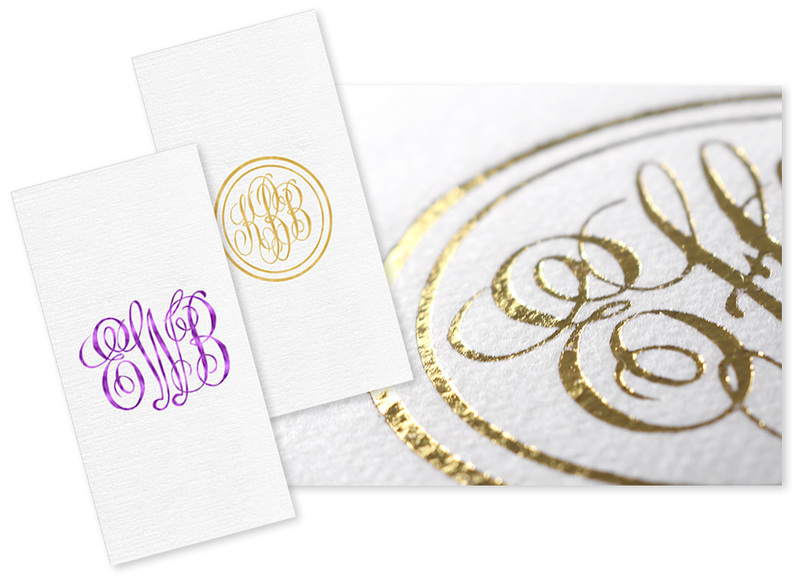 This monogram was created in a romatic typestyle featuring the intertwining of the bride and groom’s initials representing their love and union. 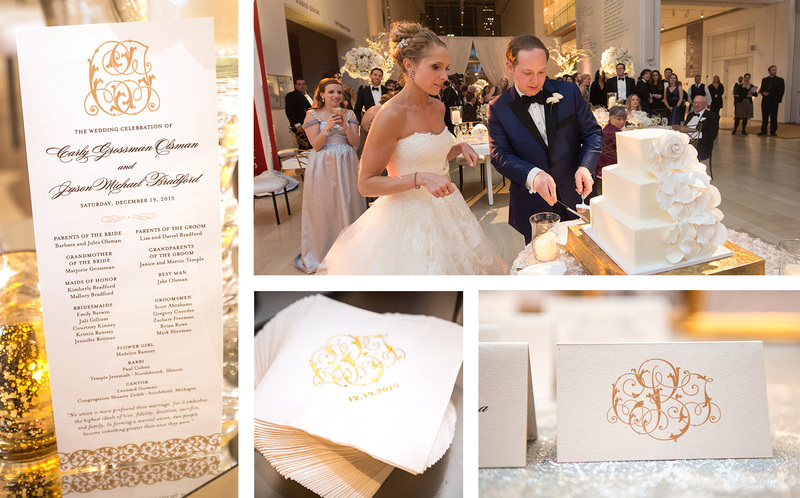 Half the napkins and guest towels provided featured a formal traditional approach, featuring the monogram and duogram. The other half used at the wedding bar and appetizer stations, were a bit more on the fun side and unexpected, but lovely! 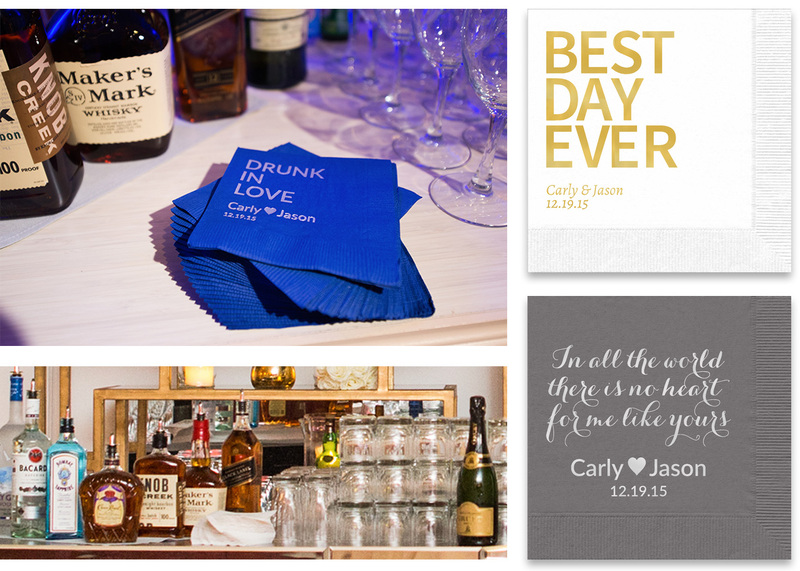 They added a dose of whimsy to printed napkin at this formal affair. These napkins were also ideal for the couple’s bar during the reception and made for a relaxed yet upbeat and still perfectly elegant presentation. 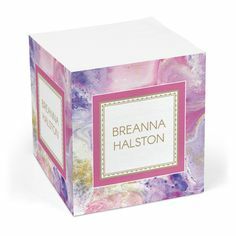 For your next occasion, consider a variety of traditional and whimsical printed wedding napkins to be used in various locations within your special occasion! 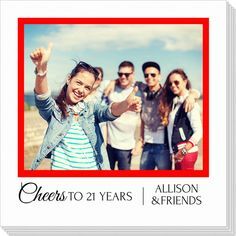 Have fun planning and enjoy all the beautiful events in your life. When entertaining, it doesn’t get more luxurious when it comes to printed napkins than our DeVille napkins. These are the type of napkins and guest towels you will find at many country clubs and 5-star restaurants. They feel thick to the touch and are excellent quality. 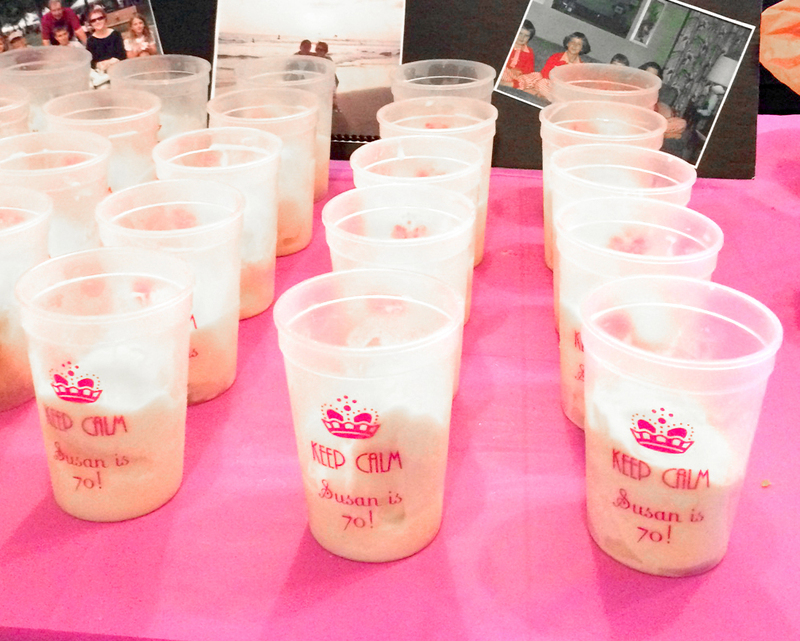 Now you can enjoy the same quality at your own event and in your own home. With a linen-texture finish, these are excellent weight paper napkins and guest towels which also feature a superior finish. 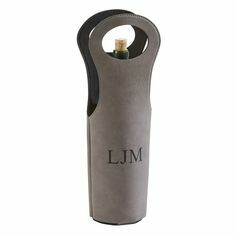 They are available in beverage and guest towel sizes and are offered in a white stock with your custom imprint in your choice of imprint color. You will be very pleased with the wonderful look of these napkins too. 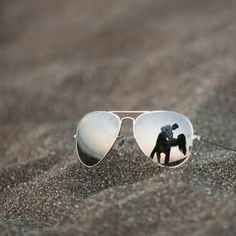 We offer an extensive selection of designs and monograms to fit every occasion and style. 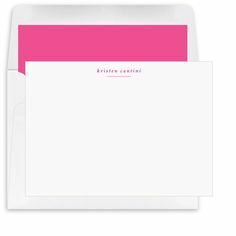 They are ideal for everything from an elegant wedding, rehearsal dinner, birthday party celebration, bridal luncheon or a special anniversary party. If you are planning a Christening, graduation or Christmas celebration, enjoy a touch of elegance at your luncheon, dinner, appetizer stations or bar. 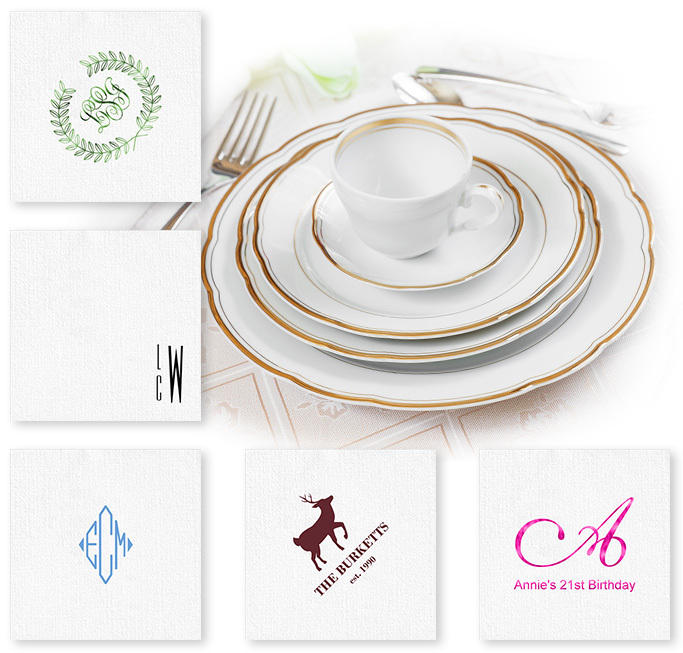 From elegant imprint to their great absorbancy, you will be proud to showcase these high quality DeVille napkins and guest towels at your next occasion. Shrink wrapped in sets of 50, these are made and printed in the U.S.A. The DeVille guest towels will make a very elegant accent to your powder room too. 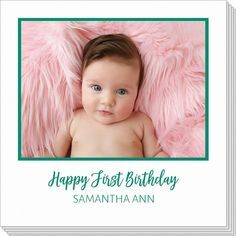 For other personalized party accessories, gifts and party supplies, visit our Wedding boutique, or our Party Supply boutique for printed plastic plates, disposable cups, printed ribbons, party favors and more. 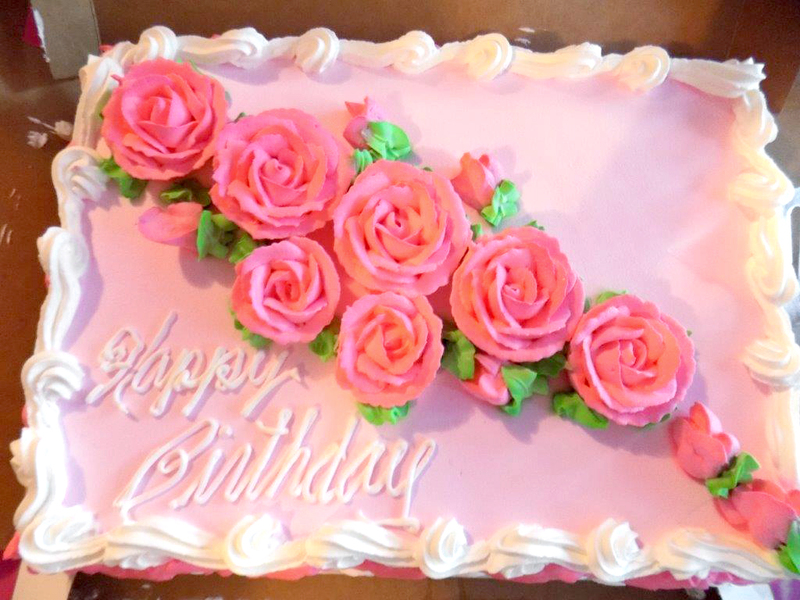 Enjoy your upcoming celebrations in beautiful style.